Over the last few years, beards have undergone a cultural rebirth to become one of the most in-demand fashion trends for men. So, if you’re looking to jump onto the beard bandwagon, society will no longer label you an unkempt man. However, with all that said, maintaining the bearded look you want will be difficult if you don’t have the right tools. In this review, we’ll be presenting what is arguably the best beard trimmer you can get as a first time buyer – the Remington MB4560. Featuring Remington’s mark of quality, this trimmer provides you with an unmatched performance that will leave you looking great after each use. Here’s a detailed rundown of its features, benefits, pros, cons, and consumer ratings. Featuring the touch logic 3.0 technology, the Remington MB4560 provides you with easy control. 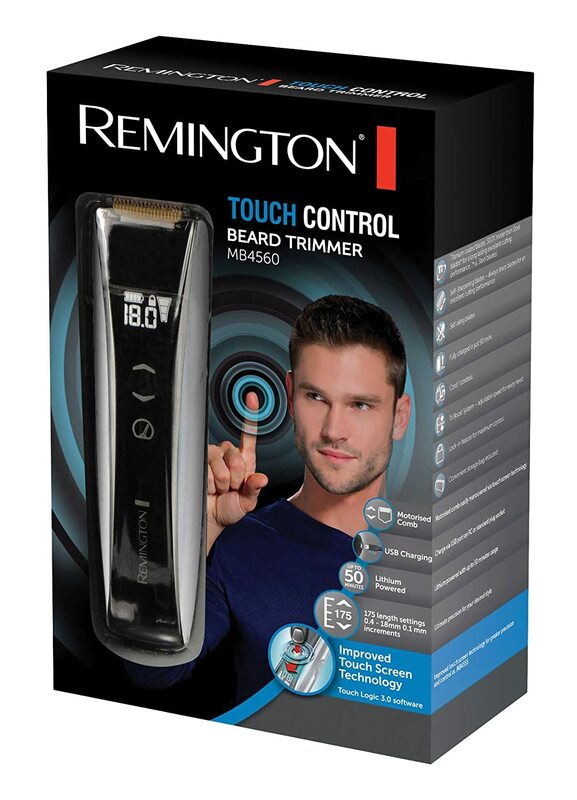 Unlike most beard trimmers which are controlled through buttons, the Remington MB4560 only requires you to tap on the trimmer’s simplified and intelligent touch-sensitive screen. The batteries of the beard trimmer are also powered by lithium and, as such, give the Remington MB4560 a long run-time and better cutting strength. Whether you want to spot a full-bearded look, stubble, or the shadow type of beard, the Remington MB4560 enables you to do so with ease. The head of the trimmer features an integrated motorized comb that offers an amazing range of 175 different length settings. These settings enable 0.1mm increments over a length range of 0.4mm to 18mm. Thanks to these length settings, you can tailor the length of trim to the exact specification needed to create whatever beard style you’re aiming for. Additionally, the Remington MB4560 will allow you to set your preferred shaving speed for greater precision and control. But luckily for you, with the Remington MB4560, you’ll not have to spend money every time you want to trim your beard. This is because the trimmer’s 3-position slide switch features a lock-in feature that helps to ensure accurate beard trimming by preventing whatever settings you have selected from being accidently altered mid-shave. Therefore, irregular shaving will not be an issue when you go with the Remington MB4560. Made with the end user in mind, the Remington MB4560 features a great design that makes it superior to most beard trimmers out there. The trimmer has a stylish design which boasts of a high-gloss white finish, giving it a great look. In addition, the blades are coated with Titanium to ensure longevity and provide the trimmer with a great cutting function. But that’s not all! In addition to the easy-to-use interface and 3-position slide switch, the Remington MB4560 has a soft touch back panel that provides comfortable handling. Thanks to this back panel, you’ll never have any difficulties navigating through the contours of your face. With 36 Amazon reviews and an overall star rating of 3.4 out of 5 at the time of writing this review, the Remington MB4560 has generated a variety of reactions. On one hand are extremely happy users who are satisfied with what this trimmer has to offer. And then on the other hand, we have unsatisfied customers. The satisfied users say that the Remington MB4560 is durable, easy to clean, easy to use, and great at its job. The unsatisfied users say that they have experienced issues with the battery, charge, and the screen of their units. These complaints seem to stem from a faulty production batch. But you’ll have nothing to worry when you shop at Amazon since you’ll be able to return or exchange the unit at no additional costs if something does not seem right with your product. If you’re serious about your appearance, the Remington MB4560 is a male grooming gadget that you should consider purchasing. Though it has elicited a mix of reviews from buyers, it still has managed to garner above average ratings. Generally, this easy-to-use beard trimmer combines functionality with cutting-edge technology and superb design to deliver power, a comfortable hold, elite cutting, and accuracy. All of these features add up together to deliver perfect results during each use. Buying this wonderful beard trimmer will enable you to step out in effortless style and confidence every single day.